Italy is a wonderful destination for beach holidays, offering nearly 8,000 kilometres of beautiful coastline just waiting to be enjoyed. Many beaches have Blue Flag status for their cleanness and good services – barefoot bliss! Several resorts have UNESCO awards for natural beauty or historical significance. You can experience everything from world-famous hill-top villages zig-zagging down to topaz-tinged waters, to hidden coves and secluded sandy beaches. Recline on the sands, paddle in the warm seas, jump off a boat into the sparkling waters – the choice is yours. Indulge in Italian Gelato ice-cream or a glass of chilled wine sitting in a beautiful Piazza (square) bathed in the peach-glow of the sun. Breathe in citrus scents from orange and lemon groves, fresh mint and oregano and be bewitched by romantic Wisteria trailing from terracotta terraces and pergolas. Below are some of our favourite places, including the Amalfi Coast, Liguria, Puglia, Tuscany Coast, Sardinia and Eastern Sicily. You can also book them as part of a multi-centre trip, to have the best of beach and bustling city - or rural retreat - in one delightful holiday. Sardinia, the second largest island in the Mediterranean, mesmerises with its dreamy soft sands and glittering seas – often turquoise, sometimes aquamarine or azure – but always enticing. The beaches are usually framed by verdant Mediterranean macquis (evergreen shrubs and small trees), as well as cool pine forests. Gaze at the beautiful views at a beach-side restaurant, while enjoying a G&T and some fresh seafood. SOUTHERN SARDINIA -A pristine collection of enchanting bays along southern Sardinia offer swathes of sandy beaches ranging in colour from sugar white to rose gold. SANTA TERESA GALLURA - Located on the rugged northern coast this traditional Sardinian town affords simply breath-taking views across the Straits of Bonifacio towards Corsica. The Pullman Timi Ama is a stunning hotel, which offers uninterrupted sea views over the Bay of Villasimius. It is located only a few minutes walk away from the beach and also a natural salt lagoon, which guests can often spot flamingos! Escape to the sun-kissed coast of Eastern Sicily with its olive trees and vineyards, bronze-gold sands, picturesque pebble beaches and inviting seas and you’ll find everything you could want. Still fairly unspoilt, it’s the perfect place to chill out with your favourite flavour of gelato ice cream, or enjoy Sicilian and Mediterranean cuisine while dining al fresco, with a glass of fine Italian wine or Prosecco. You’ll feel a world away from everyday life and are sure to forget your cares. Head to the delightful UNESCO-listed Heritage sites on the south-eastern coast of Sicily and find blue-flag winning beaches. Ragusa Ibla is a magnificent array of baroque buildings on a hillside and nearby Marina di Ragusa has a lovely, wide sandy beach stretching as far as the eye can see. Sampieri beach, a little further south, offers a long expanse of beautiful golden sand to laze upon. Also discover the well-preserved baroque old town centre of Modica, taste its famous chocolate - and afterwards you could do some surfing or windsurfing at Marina di Modica. The Grand Hotel Mazzaro Sea Palace is located just below the old town of Taormina, on the Bay of Mazzarò. The hotel is a great place to stay for those wanting to get away and relax. This newly built resort in the seaside town of Marina di Modica provides a great base for exploring this part of Sicily. Its stylish interiors and superior beachside restaurant makes this a perfect choice for the discerning traveller. The Tuscan coast, known as Versilia, boasts numerous, beautiful Blue Flag beaches and picture-postcard towns. The dramatic backdrop of the Apuan Alps (famed for marble production) completes a spectacular landscape. The Blue-Flag winning Viareggio in Northern Tuscany is loved by many, including composer Giacomo Puccini, who once lived there and you can enjoy his music, played in the open air, each summer. It’s also famous for its wonderful Art Nouveau palazzi. Following the coast north of Viareggio, sample three other Blue Flag beaches; sip a cocktail while gazing at stunning views over the Tyrrhenian Sea in Lido di Camaiore, which boasts over four kilometres of fine sand. Then there’s Marina di Pietrasanta, with about five kilometres of sandy heaven. The town of Pietrasanta, slightly inland, is home to sculptors and artists and has a vibrant piazza. There are shops, restaurants, bars, museums and even a small castle. Chic Forte dei Marmi (which means Marble Fort) has a first-class beach and a popular clothes market. The Grand Hotel Royal occupies a prime location in Viareggio, on the main promenade just across the road from the beach and close to the large pine gardens of Ponente. 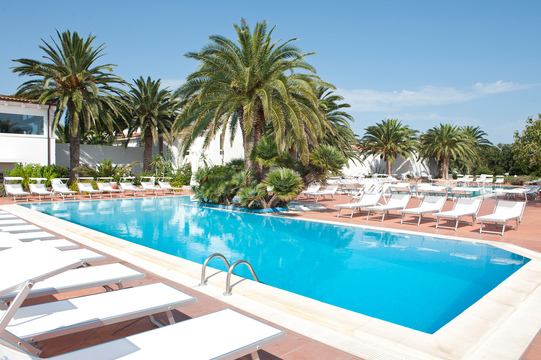 A lovely swimming pool can be found at the back of the hotel in a lush tree-filled garden. The boutique and stylish Hotel il Negresco is just across the road from Forte dei Marmi’s wide sandy beaches. It’s around a 15-minute stroll to the centre of the fashionable resort where you’ll find a large choice of bars, restaurants and shops. The Amalfi coast boasts many Blue Flag beaches including Sorrento, Anacapri, Positano, San Mauro Cilento, and Pollica-Acciaroli. There’s nothing more breath-taking than driving along the mountain road to see the vertiginous, colourful houses clinging to the cliff face in Positano and marvel at the exhilarating coastal views all around. Down on the beach however the drama has gone – sunbathing and gelato (ice cream)-eating while relaxing beside the Tyrrhenian sea is the order of the day. You can stay high up – or down on the seafront in places like gorgeous Amalfi, with its attractive main square and the Duomo. Gaze at the sea from rooftop terraces and relish local Neapolitan cuisine. From the Amalfi Coast it’s worth visiting the UNESCO World Heritage Sites of the ancient Roman cities of Pompeii and Herculaneum, which were buried beneath burning ash when nearby Mount Vesuvius erupted in 79 A.D.
Hotel Aurora has a great location in Amalfi, just a few minutes’ walk from the centre and overlooking a lovely bay. Furnished terraces in the hotel take advantage of the lovely sea views and the beach. This hotel is centrally located in Minori and makes a perfect choice for those wishing to stay in this pretty town. All the local restaurants and shops are right on your doorstep, as is the beach. Puglia, in the far south of Italy, remains unspoilt by mass tourism and has some fantastic sandy beaches and turquoise seas. It’s also very relaxed and offers over 800km of pristine coastline waiting to be explored. Add to that a mild climate and scenic landscapes of vineyards and olive groves, as well as delightful villages, and you have a great holiday destination! Salento is on the southernmost peninsula of Puglia and stretches across Italy's heel from Brindisi to Taranto. It has many great beaches with white sand and crystal-clear waters. . The charming seaside town of Otranto on the Adriatic, with its 12th-century, mosaic-adorned Norman cathedral and popular waterfront, has a hidden gem. Nearby is a sheltered, secluded cove called Porto Badisco, which is great for snorkelling. On the road there, enjoy some awesome views of Puglia at its best. There is also a cave called Grotta dei Cervi (Cave of the Deer), which has cave paintings dating back 4000 years. One of the first Masseria to open its doors to guests the Il Melograno has established itself as one of the best. Surrounded by lush gardens and ancient olive groves nestled close to the town of Monopoli. The large outdoor pool and terraces allow you to find a place of solitude in which to relax. Set in ancient olive groves close to the beach the resort is located in the heart of Puglia and a few kilometres to the historic town of Ostuni.